In the suburbs of Atlanta, there is a neighborhood that is comprised almost entirely of Victorian and Queen Anne style houses, most of which are painted very bright colors. These are houses that were built in the 1980s, so they are an exaggerated vision of typical Victorian style characteristics: gingerbread styling, intricate filigreed trimwork, towers, wings, wrap-around porches, steeply pitched roofs with gables. Fishscale shingles adorn many of these homes. Years ago, I went to a Christmas party in this neighborhood, and most of the homes were decked out like miniature gingerbread houses, with yards full of decorations and lights everywhere. Unfortunately, I do not have a picture of this neighborhood, and the holiday traffic in Atlanta makes a journey out there a bit impractical! A real life 'gingerbread house' in Elgin, IL. Note the fishscale shingles that form the siding, which gives it the characteristic gingerbread look. From springsun on Flickr. Couberg, Ontario. 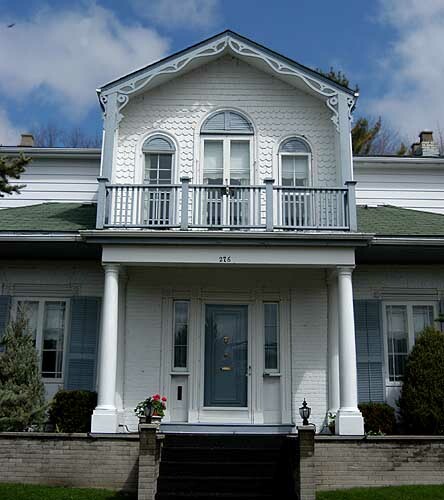 A Victorian style home with fishscale shingles on the upper fascade. The fishscale pattern is very characteristic of homes in the Victorian era, in shingles and/or the siding on the homes. 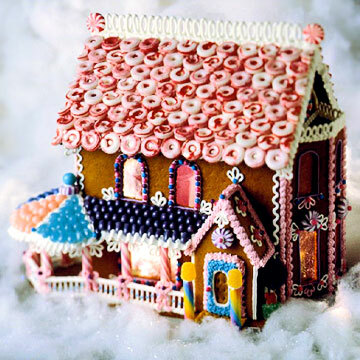 It is interesting that many gingerbread houses are often Victorian in nature, and in fact many Victorian houses are often called 'gingerbread houses'. I may need to research the link between the two when I have more time, but for now it seems reasonable to assume that the extensive details and fairytale nature of the Victorian architecture style makes it a good subject matter for a detailed gingerbread house. A Victorian style gingerbread house, complete with a wrap around porch, gables, and a fishscale roof made with lifesavers. From the Better Homes and Gardens website. A beautiful gingerbread house with fishscale shingles made out of Necco wafers. From the Crafting Jen blog. A mall in Manila, creating a gingerbread masterpiece with fishscale shingles on the roof. The fishscale pattern is not as common in furniture, but Julian Chichester mkes a beautiful chest of drawers using this design. I have seen this in person, and it is striking. Stone carving with the fishscale design, from Didyma, an ancient temple in what is now Turkey. From h savill's flickr pictures. Here in Richmond, VA, I live in the city in "The Fan District." The Fan is home to the largest collection of Victorian houses on the East Coast (my house was built in 1907.) I'll keep my eyes peeled for examples on my next walk. Thanks for letting me see my neighborhood in a new light! anyway - those houses were built in 1980 - not 1880? I love the gingerbread houses!! No, we are talking about the Atlanta suburbs....nothing was built in 1880 (just kidding, but I think it would be very hard to find something in the suburbs built in the 1800s). So, we are talking 1980s, over the top Victorian style! Got to love it! I love the fish scales! There are many fabulous examples of this in New Orleans. I'll try to send some pictures. And the fish scale carving from Didyma- wonderful. If you get a chance to check it out, I put up my first post on my new blog last night bayoucontessa.blogspot.com and I plan to feature many of these kinds of architectural details which can be found in New Orleans. Yes, I am sure that there are some splendid examples in New Orleans! I have little time to post this week, so I pulled a few basic photos to illustrate the point. Very good comparison between Victorian houses and Gingerbread houses. Gingerbread houses are very cute caricatures of the real thing. I never thought of it that way before. What a wonderful architectural feature to highlight. You sure have a great grouping of diverse designs here. I Love gingerbread houses! :) The fishscale dresser is indeed very interesting. Great comparison and post! Even though I am not the biggest fan of Victorian architecture, I love your post. The fishscale pattern is definitely making a comback on the runways, I have noticed. A timely post for both fashion and Christmas! You've posted one of my favorite Chichester pieces. Love this post!! Dear things - you do the most interesting posts! I love it! the fist house is my favorite of all thee pictures! I never thought of those homes as Gingerbread houses before. How fitting! The drive may not be practical, but I love going out of my way to see things that are so different from the norm. Oddly enough, even if I don't like the look of the homes, they certainly spurred on ideas! The "Fishscale" carving from Didyma is actually a rope of laurel leaves, even though the effective pattern is much the same. We went to Ker Place in Onancock, Maryland, built ca 1799. The guide there said that fish-scale carvings on the doorposts was a secret code to say that a Scotsman lived there. Has anyone heard of his before? Richard, now that you mention it, I can see that the Didyma carving could very well be laurel leaves. I will certainly take your word for it. I am not even sure how I came across that image, but the overall pattern is very pleasing to my eye. Thanks for the comment.